Rudi’s Gluten-Free Bakery has been celebrating Celiac Awareness Month by giving back to the national celiac disease organizations dedicated to helping raise awareness. Through May 31, Rudi’s Gluten-Free fans can get and give some dough through Spread the Bread, a Facebook campaign with the goal of raising up to $30,000 for the leading celiac disease education and awareness organizations, including the National Foundation for Celiac Awareness, Celiac Disease Foundation, Celiac Sprue Association and Gluten Intolerance Group. 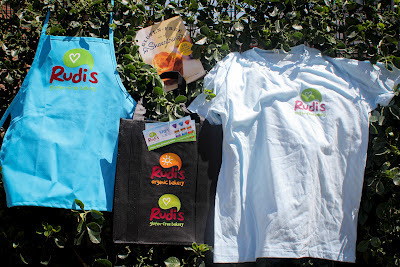 Rudi’s Gluten-Free Facebook fans are invited to select one of these four community partners to receive a $1 donation from Rudi’s Gluten-Free and then click for a downloadable coupon good for $1 off any Rudi’s Gluten-Free product. Fans can track the amount pledged to each organization and help encourage family and friends to donate to their favorite organization. Rudi’s Gluten-Free just introduced tortillas made with whole-grain flours. The new line - sampled at last month's Celiac Awareness Tour stop in King of Prussia - includes soft and pliable Plain, Spinach and Fiesta Tortillas. Rudi's is offering one lucky Gluten Free Philly reader a prize pack that includes an apron, a T-shirt, a copy of the Gluten-Free on a Shoestring cookbook by Nicole Hunn, Rudi’s Gluten-Free coupons, a reusable shopping bag, and bread clips. To enter up to three different ways, follow the instructions below. Entries are being accepted through Sunday, June 3. You must enter a valid email address so that I can contact you if you're the winner. My new 'Gluten Free Philly' Delaware Dining Guide is available as an e-book download. The guide provides hyperlinked listings for restaurants, bakeries, markets and attractions throughout the First State, including the southern resort towns like Rehoboth Beach and Dewey Beach. Updated editions published within 30 days of initial purchase will be emailed to purchasers free of charge. I would try the plain tortilla first, then move on to other flavors. I'm interested in trying the spinach one, because I've never had a spinach tortilla before! I'd love to try to fiesta tortilla! Love Rudi's and paired with Gluten free Phila make the best pair ever! Man, what I wouldn't give for something other than a corn tortilla. Mind you, I'm getting used to them, but I always preferred the taste of flour to corn and the fiesta tortillas sound right up my alley. Now, to get my grocery stores to carry them! I tried the wraps at the Celiac Awareness tour and can't wait for them to become available around here. I would definitely want to try the fiesta tortilla first! I would love to try the fiesta tortilla! YUM! I would love to try the plain tortilla first! I was at the tour stop in King Prussia and happy to see a gluten free tortilla that doesn't break apart! I would like to try the plain tortilla first. I would love to try the plain tortilla! Can't wait to try Rudi's tortillas. My son gets so upset when they break and fall apart. The spinach tortilla sounds very versatile, can't wait to try them. I want to try the plain tortilla. Spinach tortilla without a doubt...YUM!